Martha Herrera Coria is now unsure of her immigration status, but she's not afraid to speak out. The 27-year-old Mexican woman is a beneficiary of the Deferred Action for Childhood Arrivals program, which was thrown into turmoil Tuesday when President Donald Trump announced a plan to end it. "I'm speaking out because so many are afraid to," Herrera Coria told Seven Days Tuesday through an interpreter. "Now is not the time to be defeated, or hide and go back living in the shadows." 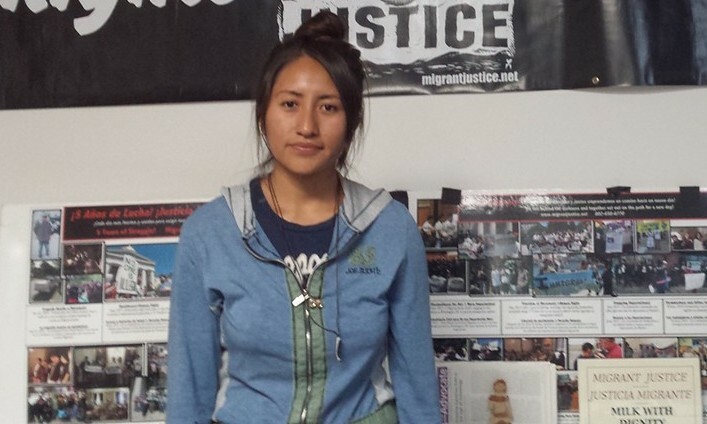 Herrera Coria arrived in the U.S., undocumented, with her siblings when she was 15. She gained DACA status in 2012, the same year that president Barack Obama issued an executive order granting temporary relief from deportation for undocumented youth who came to the U.S. as children. The U.S. Citizenship and Immigration Services has so far granted DACA status to about 800,000 undocumented immigrants. DACA recipients — sometimes called "Dreamers" after a similar, failed bill considered by Congress in 2001 — are able to stay in the U.S. to study, obtain a work permit and apply for a Social Security number. The most recent statistics show that Vermont is home to 42 DACA recipients, the fewest of any state. But Tuesday's decision means the program will be phased out over the next six months, giving the Republican-controlled Congress a short window to decide on the fate of DACA recipients such as Herrera Coria. "Having DACA has meant having freedom in this country," she told Seven Days during an interview at Migrant Justice, where the group's spokesman, Will Lambek, acted as an interpreter. "It's been the freedom to have a better job with better pay, it's been the freedom to leave my house, to travel without fear that because of the color of my skin, for being a person of color, that I would be detained and deported." Herrera Coria moved to Vermont last year after spending much of the past 12 years in New York. Her parents and grandmother still live in Mexico and they, too, are worried for her. She is currently a member of Migrant Justice, a Burlington-based human rights organization that focuses on advocating for undocumented dairy workers in Vermont. "They live in this anguish of what could happen to me," Herrera Coria said of her family. They fear she'll be detained, mistreated "behind bars and kicked out of my country like I'm nothing, and being sent back to Mexico." Herrera Coria isn't speaking out just for DACA recipients. She's calling on politicians to help all undocumented immigrants, including those who don't qualify for DACA. Being a DACA recipient allowed her to get a better-paying job and a driver's license, she said. "Now's the time when we need your support more than ever," Herrera Coria said. "And not just for those of us who can lose DACA, but for all immigrants, because migration is a human right." Lambek agreed. "It's never been just about DACA," he said. While Dreamers might sometimes be seen as "special" or "a class apart," the new development means that the "800,000 youths who have benefited from this program are being shoved into the same boat as the 10.5 million" undocumented immigrants, Lambek said. "Having this program at risk is having an opportunity for the community to unite and push for something that affects everybody." Eliminating the DACA program was one of Trump's core campaign promises. In discussing the decision Tuesday morning, U.S. Attorney General Jeff Sessions said that the U.S. "cannot admit everyone who would like to come here." "Therefore, the nation must set and enforce a limit on how many immigrants we admit each year and that means all cannot be accepted," Sessions said. "This does not mean they are bad people or that our nation disrespects or demeans them in any way. It means we are properly enforcing our laws as Congress has passed them." The Department of Homeland Security also announced in a memorandum that its personnel will take "all appropriate actions to execute a wind-down of the program." Vermont's Democratic congressional delegation, as well as Republican Gov. Phil Scott, denounced Trump's decision. Ahead of Tuesday's announcement, Middlebury College was one of several schools to issue a statement affirming its support for both DACA and undocumented students. "This past year we offered assistance to help with DACA renewals, access to an immigration lawyer, and covered other emergency expenses as needed," college president Laurie Patton wrote in an email last Friday. "We pledge to continue with this support and to look for ways of offering resources in case a change of immigration policy leads to a loss of status that invalidates our students’ ability to work or collect financial aid." The arrests of two young Mexican farm workers over the weekend sparked a Monday morning protest outside a South Burlington jail where one was held.